Faculty and students from the Center for Visual Computing will present eight papers at ECCV, the European Conference on Computer Vision, Oct. 8-16, 2016 the premier international forum for computer vision research this year, held in Amsterdam. Visual Computing Center Faculty and students will also present three papers at the SIGGRAPH Asia 2016 computer graphics conference, held in Macao in early December. Did you miss the student org showcase, Engineers on the Green on Monday, Sep 26? From video game development to making rockets, there's a student org at the Jacobs School for everyone. Many of them gathered to showcase their projects and recruit new members at the event! For a full list of student orgs, visit this page. Yesterday was the first day of the new school year. Bioengineering junior Julie Yip took over the Jacobs School of Engineering Instagram. Check out her day going around campus to classes, browsing Library Walk, and meeting with her friends! 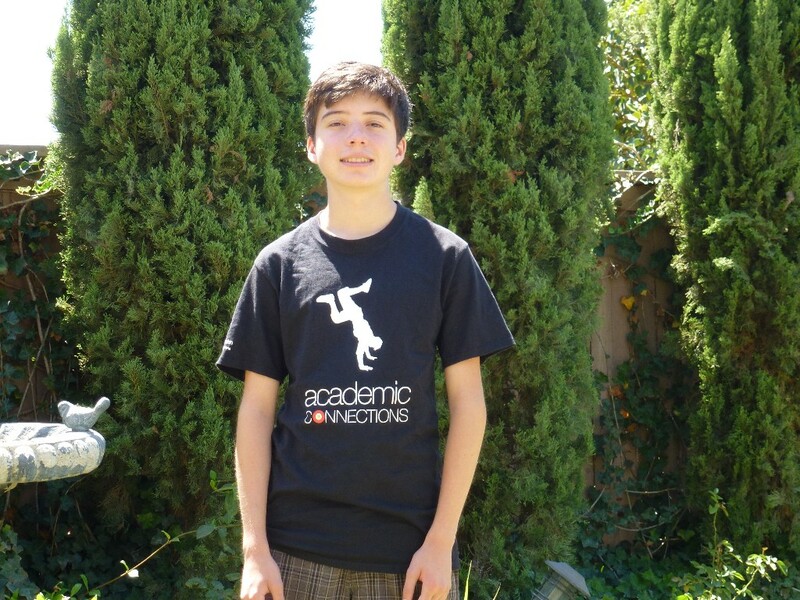 Omid Hedayatnia, high school participant of the Academic Connections Program. UC San Diego always has plenty of opportunities for young minds to thrive and grow year-round. One very important program that helps youth explore their academic potential is the UC San Diego Academic Connections (AC) pre-college program. Gifted high school students from around the world choose UCSD’s pre-college programs, like Academic Connections, to prepare for success, and experience college-level academics. During this year’s AC graduation ceremony, Dr. Ebonee Williams, Executive Director of the Gordon Center, gave a passionate speech about the potential of the students at AC, and how they will have a challenging but successful future ahead. AC connects high achieving high school students with college-level subjects of their choices. Courses are led and designed by exceptional graduate students as well as world-renowned UCSD faculty researchers from a wide array of academic disciplines, all of whom are experts in their respective fields. Academic Connections is unique for providing high-school students a thorough glimpse of the academically rigorous college experience at UCSD. Students choose one of approximately 25 courses offered, and accumulate vast knowledge during the three-week class of their choice. Classes meet five hours a day, capping off at about 22 students per class. The small enrollment was specifically chosen to drive quality interaction with instructors. “Academic Connections was an extraordinary experience for me,” said Omid Hedayatnia, one of the students from AC’s Summer 2016 program. “I want to continue pursuing computer science and artificial intelligence, so I chose the Cognitive Science program.” Omid, who is now the president of his high school’s computer club, enjoyed learning about the different facets of cognitive science, considering that it is a highly multidisciplinary field involving psychology, neuroscience, computer science, linguistics, anthropology, and philosophy, with a central focus on the mind’s processes. Students also were able to experience residential life at UCSD, giving them an eye-opening glance about what college living will be like. AC students had the opportunity to participate in recreational activities all day, as well as on the weekends. “There were all kinds of programs, like sports, art, and dancing,” said Omid. UC San Diego knows that start-ups and collaborations pave the way towards the future, so the UANDES Life Tech Challenge reflects a thriving partnership between UANDES, a private nonprofit university in Chile, and the von Liebig Entrepreneurism Center. Through the efforts of Anil Sandarangani, MBA graduate from UC San Diego, a thriving partnership between our university and the University de los Andes (UANDES) now exists. 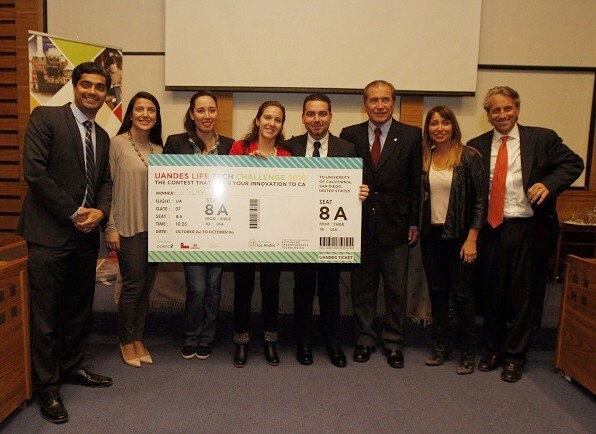 UANDES is a private, non-profit university in Santiago, Chile renowned for research and innovation. Its business and engineering courses are taught completely in English. The partnership, achieved through the von Liebig Entrepreneurism Center, was created to bridge the gap between idea formation and the start-up launch process through training and mentoring. Personalized tactics and mentorship create more successful technology companies and attract additional talent and resources to the life sciences industries in Chile. Partnerships like these help to foster new inventions and creations, while encouraging cross-cultural learning and understanding from different cultures. von Liebig Entrepreneurism Center looks forward to continuing programs like these and expanding with other projects in the future, to promote global entrepreneurialism and cultivate the startup environment in the STEM field. 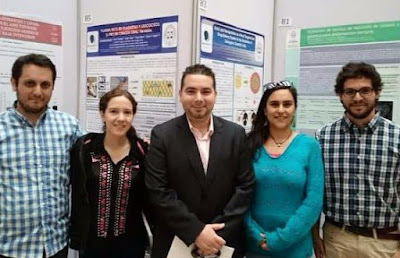 Winning team X'Plant from the Life Tech challenge, from left to right: Cesar Trigo, PhD; Constanza Jimenez, DDS; Ziyad Haidar, DDS; Paula Ibarra, PhD; Javier Campos . von Liebig Mentor, Michael Krupp, PhD in Biochemistry from the University of Rochester, tied together his knowledge of life science and business to conduct a two-day seminar at UANDES on innovation and entrepreneurism in the life science industry. Dr. Krupp’s experience from serving as an executive at Pfizer and Chugai Pharma, as well as an advisor to several biotech startups, helped him captivate and educate the students. He watched as 12 teams made presentations on their startup companies in a wide range of life science technologies, such as biotech, healthcare, food technologies and medical therapies. Dr. Krupp selected the top 6 teams that have the best chance for commercialization into the market. The top six teams received mentorship from August through September from four von Liebig business and technology advisors with expertise in life sciences. The mentoring was essential in helping these teams stay on track through the commercialization process. On September 13 at the final pitch presentation, X’Plant was selected as the winner of the Life Tech Challenge. The X’PLANT team is led by a team of dentists. The presentation was made by Constanza Jimenez, DDS. As a practicing dentist, Dr. Jimenez and her colleagues have developed a set of tools for the non-invasive removal of failed dental implants. The team’s mentor is Garrett Smith, who holds a PhD in Bioengineering at UC San Diego, and is also a co-founder of three life-tech startups. Maria Eliana Manquez, MD led the MD EyeCare team. As a practicing physician, Dr. Manquez has developed an online application for the early detection of eye disorders in children. John York, who holds a Doctorate in Pharmacy from the University of Michigan and has his own biotech consulting company, is the mentor to this team. Mentoring two teams in the medical diagnostics space, Richard Garber, PhD, has a degree in Biology from Yale and is currently a drug development consultant. One of the teams he mentors is Neurogos, led by CEO Alejandro Bisquertt. The team has developed a diagnostic test for Alzheimer’s and other forms of dementia using blood biomarkers. The test provides key information for more effective treatment. Dr. Garber also mentored Pregnostica, led by Alejandra Chapparro DDS. As a dental surgeon and UANDES faculty member, Dr. Chapparro uses saliva biomarkers to predict gestational diabetes and preeclampsia early in pregnancy. Green Biofactory, led by Daniela Fuentes PhD, develops proteins using algae to serve as a food supplement for pork. The team’s mentor is Karl Francis, PhD, holding a PhD in Bioengineering from UC San Diego and serving as Principal Scientist at Accriva Diagnostics. Dr. Francis also mentored the Blood Vessels team led by Camila Wilkens, PhD. This team uses mesenchymal stem cells and biomaterials to create small blood vessels with the mechanical and biological properties of real blood vessels. On August 18, the Hacking 4 Defense (H4D) program held its very first information session in the basement classroom of the Powell-Focht Bioengineering Hall, bringing together students and faculty alike. Hacking 4 Defense is a class that was originally established at Stanford, but is now expanding to universities like UC San Diego, per Dean Albert Pisano’s desire to establish a strong relationship between UC San Diego and the military. Hacking 4 Defense will prepare graduate students, post-docs, as well as select undergraduates to become fast-paced thinkers with unique entrepreneurial mindsets. Student teams will work to find a solution out of a myriad of real national security problems pointed out by the Department of Defense (DoD) as well as the Intelligence Community. Real professionals in a variety of fields will serve as mentors to student teams in the program. The Lean Startup Theory is a method that favors experimentation over strategic and excessive planning, emphasizing the importance of jumping in, making the guesses, and filling in the blanks of factual information later. Harvard Business Review claims this method will change “everything” for start-ups. H4D will combine this theory with a plethora of hands-on experience, requiring groups to get their “hands dirty” by constantly communicating with not only each other, but resources outside the classroom to find a solution to their projects. 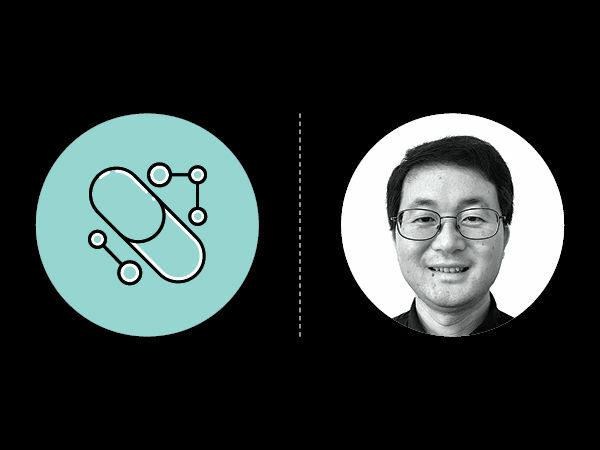 Instructors Ellen Chang and Travis DeMeester both have extensive experience in innovation and business. Chang was in the Navy for eight years and remains active, worked at Northrop Grunman for 12 years, and is an Angel investor. DeMeester was a former Marine captain with a colorful background in Aerospace, and is currently a principal at BMNT Partners. For the rest of this article about the instructors of the class, see our blog. There's something fishy going on in the Department of NanoEngineering at UC San Diego. Last summer, 3D-printed microfish made a big splash in the news. Now, researchers have created "nanofish" -- tiny metallic fish 100 times smaller than a grain of sand -- that could be used to deliver drugs to particular places in the body. The nanofish are made of gold and magnetic nickel segments, which enable the fish to move and be guided by an external magnet. "We believe they could be useful for medicine delivery, non-invasive surgery and single cell manipulation," said Jinxing Li, a PhD student in the lab of nanoengineering professor Joseph Wang who led the research. Tele-operation of robots has existed for a long-time. Much of the early work was carried out in the handling of radioactive material, where direct contact by people is not an option. These systems were all purely tele-operated. This is the same type of model we see applied to medical robots such as minimally invasive systems. The Intuitive Surgical System – Da Vinci [URL] is a great example of such a system. The objective is here minimization of trauma to the body. For Aerospace Systems we have long known the auto-pilot which is a shared autonomy system. The pilots will typically handle take-off and landing, whereas cruise flight is handled by the auto-pilot. For Unmanned Aerial Vehicles (UAVs) the pilots / operators are sitting on the ground and operating vehicles that may be airborne for as long as 36 hours. We are seeing similar applications for smaller UAVs for commercial and entertainment tasks. New commercial applications include building inspection and mapping of construction sites [URL]. For entertainment companies such as DJI [URL] build robots that are radio controlled. We are slowly seeing small functions such as level keeping or automation tracking of skiers which are examples of shared autonomy. The systems are launched and an objective is specified (tracker me, or maintain level) which is performed autonomously. As we explore the shared control of systems with some functions performed autonomously and others carried out by an operator it is essential to consider the fluency of human-robot interaction, to consider the cognitive aspects of systems and to ensure that engineers use these models as an integral part of their systems design. On October 28, 2016, the University of California San Diego will host the annual Contextual Robotics Forum with the theme of “Shared Autonomy: New Directions in Human-Machine Interaction”. Join us for a day focused on the future of robotics and shared autonomy. You'll meet world-leaders in robotics and connect with the robotics ecosystem at UC San Diego and in the region at the technology showcase. Over the next few years we will see tremendous progress on design of systems that off-load the operator but we will be challenged in doing this in a way that still allows the operator to intervene for challenge cases. So far few systems have managed to do this with a high degree of fluency. We need more research at the intersection of cognitive science, system engineering and robotics to fully leverage next generation systems with shared autonomy. Did you know that next week is National Drive Electric week? Help us celebrate by voting for the University of California San Diego and EVgo’s “Second-life Energy Storage + Level 3 EV Charging” project for the Energy Storage North America 2016 Mobility Innovation Award! The UC San Diego Center for Energy Research began a partnership with EVgo, a leading provider of electric charging solutions, two years ago to develop this project and others as part of EVgo’s technology and demonstration program. The goal? Create a microgrid of technologies on the existing microgrid at UC San Diego. “This is a shared vision for the future that combines the fastest electric vehicle charging technology, second-life battery energy storage, and integration of solar to mitigate the impact on the UC San Diego microgrid during peak hours,” said Byron Washom, Director of Strategic Energy Initiatives at UC San Diego. The project is the first of its kind and consists of four charging stations, a solar panel roof, and two second-life batteries. The stations have been open to the public for the last year. Second-life batteries are batteries that use to be in a car and are still useful. They help to reduce the cost of a charging station and therefore the cost of owning and operating electric vehicles. “Using second-life batteries also defers the period of time in which we as a society will have to recycle them,” said Washom.